Southworth Sailor: sailing at last! With the lousy weather this spring and my mooring buoy gone, it took me longer to get the sailing started. Yesterday, Calvin helped me launch the boat and drop a new mooring anchor system. This afternoon I went for a three hour sail down Colvos Passage. 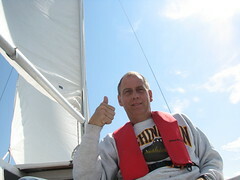 The wind was moderate to slight - good conditions for the first sail of the year. Another first today was a craigslist purchase. Esther has been looking for end tables on craigslist for quite some time. She saw some she wanted, so it was a quick call and trip to Mercer Island. It was good to be home this weekend and get some things accomplished.